This article is about the human Y-DNA haplogroup. For the human mtDNA haplogroup, see Haplogroup C (mtDNA). Haplogroup C is a major Y-chromosome haplogroup, defined by UEPs M130/RPS4Y711, P184, P255, and P260, which are all SNP mutations. It is one of two primary branches of Haplogroup CF alongside Haplogroup F. Haplogroup C is found in ancient populations on every continent except Africa and is the predominant Y-DNA haplogroup among males belonging to many peoples indigenous to East Asia, Central Asia, Siberia, North America and Oceania. The haplogroup is also found at moderate frequencies among certain indigenous populations of Southeast Asia. In addition to the basal paragroup C*, this haplogroup now has two major branches: C1 (F3393/Z1426; previously CxC3, i.e. old C1, old C2, old C4, old C5 and old C6) and C2 (M217; the former C3). Estimated migration root of haplogroup C in East and South Asia. Haplogroup C-M130 seems to have come into existence shortly after SNP mutation M168 occurred for the first time, bringing the modern Haplogroup CT into existence, from which Haplogroup CF, and in turn Haplogroup C, derived. This was probably at least 60,000 years ago. Although Haplogroup C-M130 attains its highest frequencies among the indigenous populations of Kazakhstan, Mongolia, the Russian Far East, Polynesia, Australia, and at moderate frequency in Korea and Manchu people, it displays its highest diversity among modern populations of India. It is therefore hypothesized that Haplogroup C-M130 either originated or underwent its longest period of evolution within India or the greater South Asian coastal region. Its northward expansion in East Asia started approximately 40,000 years ago. Males carrying C-M130 are believed to have migrated to the Americas some 6,000-8,000 years ago, and was carried by Na-Dené-speaking peoples into the northwest Pacific coast of North America. Asia is also the area in which Haplogroup D-M174 is concentrated. However, D-M174 is more closely related to haplogroup E than to C-M130 and the geographical distributions of Haplogroups C-M130 and D-M174 are entirely and utterly different, with various subtypes of Haplogroup C-M130 being found at high frequency amongst indigenous Australians, Polynesians, Vietnamese, Kazakhs, Mongolians, Manchurians, Koreans, and indigenous inhabitants of the Russian Far East; and at moderate frequencies elsewhere throughout Asia and Oceania, including India, Sri Lanka and Southeast Asia. Whereas Haplogroup D is found at high frequencies only amongst Tibetans, Japanese peoples, and Andaman Islanders, and has been found neither in India nor among the aboriginal inhabitants of the Americas or Oceania. C-P343: outside C1a1 (M8), C1b2a (M38), C1b1a1 (previously C5; M356), C1b2b (previously C4; M347), and C2 (ex-C3; M217), but its relation to other branches is not yet tested. 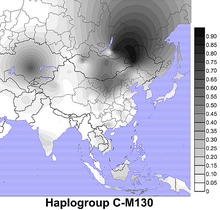 Projected spatial frequency distribution for haplogroup C in East Asia. The distribution of Haplogroup C-M130 is generally limited to populations of northern Asia, eastern Asia, Oceania, and the Americas. Due to the tremendous age of Haplogroup C, numerous secondary mutations have had time to accumulate, and many regionally important subbranches of Haplogroup C-M130 have been identified. in Europe among males with the surname Llach originating from Garrotxa, Catalonia, Spain (but not males with the same surname from other areas). C* (M130) was also identified in prehistoric remains, dating from 34,000 years BP, found in Russia and known as "Kostenki 14". 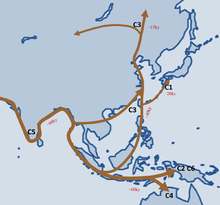 Haplogroup C2 (M217) – the most numerous and widely dispersed C lineage – which is believed to have originated in South East/Central Asia, spread from there into Northern Asia and the Americas. C-M217 stretches longitudinally from Central Europe and Turkey, to the Wayuu people of Colombia and Venezuela, and latitudinally from the Athabaskan peoples of Alaska to Vietnam to the Malay Archipelago. Found at low concentrations in Eastern Europe, where it may be a legacy of the invasions/migrations of the Huns, Turks and/or Mongols during the Middle Ages. Found at especially high frequencies in Buryats, Daurs, Hazaras, Itelmens, Kalmyks, Koryaks, Manchus, Mongolians, Oroqens, and Sibes, with a moderate distribution among other Tungusic peoples, Koreans, Ainus, Nivkhs, Altaians, Tuvinians, Uzbeks, Han Chinese, Tujia, Hani, and Hui. The highest frequencies of Haplogroup C-M217 are found among the populations of Mongolia and Far East Russia, where it is the modal haplogroup. Haplogroup C-M217 is the only variety of Haplogroup C-M130 to be found among Native Americans, among whom it reaches its highest frequency in Na-Dené populations. C-P33 (C1b2a1a): found at high frequencies among Polynesian males. C-M8 (C1a1), is now found regularly only with low frequency (approximately 5% of all samples) in Japan. It also has been found in an academic study in one individual on Jeju Island and in commercial testing in one individual who has reported an origin in Liaoning province of China and one individual who has reported an origin in Seoul. C-M38 (C1b2a; previously C2), among some local populations within Indonesia, Melanesia (especially New Guinea), Micronesia, and some islands of Polynesia, C-M38 has become the modal haplogroup, probably due to severe founder effects and genetic drift. C-M356 (C1b1a1; previously C5) has been detected with low frequency in samples from India, Nepal, Pakistan, Afghanistan, Arabia, and northern China. C-V20 (C1a2; previously C6) is found at low frequencies amongst Southern Europeans. The 7,000-year-old remains of a hunter-gatherer from La Braña (modern Asturias, Spain) carried it, and C1a2 was also present in Hungary at around the same time. In 2016, a 35,000-year-old remains of a hunter gatherer from the Goyet Caves (Namur, Belgium) and a 30,000-year-old remains of a hunter gatherer from Dolni Vestonice (Moravia, Czech Republic) were found with this haplogroup. C-B66/Z16458 (C1b1a) is found at low frequencies in South Asia, Central Asia, and Southwest Asia. C-M93 (C2a) is found sporadically in Japanese people. C-M48 (C2b1b; previously C3c) is found at high frequencies in northern Tungusic peoples, Kazakhs, Oirats, Kalmyks, Mongolians, Yukaghirs, Nivkhs, Koryaks, Itelmens, and Udegeys, with a moderate distribution among southern Tungusic peoples, Buryats, Tuvinians, Yakuts, Chukchi, Kyrgyz, Uyghurs, Uzbeks, Karakalpaks, and Tajiks. C-P53.1 (C2c) is borne by about 10% of Xinjiang Sibe males, with low frequency in Mongolia and among Evenks, Ningxia Hui, Xizang Tibetan, Xinjiang Uyghur, and Gansu Han. C-P343 occurs at a high frequency among males from Lembata (17.4% of 92 samples), with lower frequencies in Flores, Pantar, and Timor. P343 is outside C1a1 (M8), C1b2a (M38), C2 (ex-C3; M217), C1b2b (previously C4; M347), or C1b1a1 (previously C5; M356), but its relation to other branches is not yet tested. C-P55 (C1b3) is found in the New Guinea Highlands. C-L1373/F1396 (C2b) has been identified in Central Asia. C-P39 (C2b1a1a) is found among several indigenous peoples of North America, including some Na-Dené-, Algonquian- and Siouan-speaking populations. C-F2613/Z1338 (C2e): both Central Asia and East Asia. C-M407 (C2e1a1a) has been found with high frequency among Buryats, Soyots, and Khamnigans, moderate frequency among other Mongols and Kalmyks, and low frequency in Armenian, Bai, Cambodian, Han Chinese, Japanese, Kazakh, Korean, Manchu, Tujia, Uyghur, and Yakut populations. Kayser et al. (2006) found C-M130(xM38, 390.1del, M217) in 10.3% (4/39) of a sample from the Philippines, 10.0% (6/60) of a sample from Arnhem Land, 6.5% (2/31) of a sample from Nusa Tenggara, 5.3% (3/57) of a sample from Sumatra, 3.0% (1/33) of a sample from the Papua New Guinea coast, 2.9% (1/34) of a sample from the Moluccas, 1.9% (1/53) of a sample from Java, and 0.9% (1/107) of a sample from Fiji. C-RPS4Y (now C-RPS4Y711) (xM38) Y-DNA is quite common among populations of the Indonesian province of East Nusa Tenggara and independent East Timor: 13/31 = 41.9% Lembata, 16/71 = 22.5% Flores, 5/43 = 11.6% Solor, 10/96 = 10.4% Adonara, 3/39 = 7.7% East Timor, 1/26 = 3.8% Alor, 1/38 = 2.6% Pantar. All C-RPS4Y(xM38) individuals except the singleton from Alor were described as Austronesian speakers. C-RPS4Y (now C-RPS4Y711) (xM38, M217) Y-DNA occurs, according to a study published in 2010, at rather high frequencies in most populations of central Indonesia (115/394 = 29.2% Flores, 21/92 = 22.8% Lembata, 19/86 = 22.1% Borneo, 6/54 = 11.1% Mandar, 1/9 = 11.1% Timor, but only 1/350 = 0.3% Sumba). C-RPS4Y(xM38, M217) Y-DNA generally becomes rare toward the west (2/61 = 3.3% Java, 1/32 = 3.1% Malaysia, 9/641 = 1.4% Balinese, 0/38 Batak Toba, 0/60 Nias, but 10/74 = 13.5% Mentawai) and toward the east (1/28 = 3.6% Alor, 0/30 Moluccas, 1/15 = 6.7% PNG Coast, 0/33 PNG Highland, 0/10 Nasioi, 0/44 Maewo (Vanuatu), 1/16 = 6.3% Micronesia, 0/64 Polynesia). C-RPS4Y711(xM8, M217) Y-DNA has been found in 17% (6/35) of a sample of Yao from Bama, Guangxi in south-central China, 4/35 = 11% of a sample of Hui and 2/70 = 3% of a pair of samples of Uyghur from northwestern China, and 3/45 = 7% of a sample of Hezhe and 1/26 = 4% of a sample of Ewenki from northeastern China. C-RPS4Y711(xM8, M38, M217) has been found in 48.5% (16/33) of a sample of indigenous Australians, 20% (12/60) of a sample of Yao, 6.1% (3/49) of a sample of Tujia, 5.9% (1/17) of a sample of Micronesians, 5.5% (3/55) of a sample of eastern Indonesians, 4.0% (1/25) of a sample of western Indonesians, 3.3% (3/91) of a sample of Sri Lankans, 3.1% (1/32) of a sample of Malays, 2.5% (10/405) of a sample of Indians, 2.2% (1/46) of a sample of Papua New Guineans, 1.7% (1/58) of a sample of Miao, and 1.5% (1/67) of a sample of Uyghurs. Zhong et al. (2010) have found C-M130(xM8, M38, M217, M347, M356, P55) Y-DNA in 9.09% (1/11) of a sample of Mulao from Guangxi, 8.20% (5/61) of a sample of Hui from Ningxia, 7.96% (9/113) of a sample of Yao from Guangxi, 7.69% (2/26) of a sample of Tujia from Hubei, 6.90% (2/29) of a sample of Shui from Guizhou, 3.28% (2/61) of a sample of Xibe from Xinjiang, 1.45% (1/69) of a sample of Zhuang from Guangxi, 0.92% (1/109) of a sample of Buyi from Guizhou, 0.87% (2/231) of a sample of Han from Guizhou, and 0.74% (1/136) of a sample of Han from Yunnan. A majority of these individuals share an identical 8-loci Y-STR haplotype: DYS19=15, DYS389I=12, DYS389b=16, DYS388=13, DYS390=21, DYS391=10, DYS392=11, DYS393=12. Di Cristofaro et al. (2013) have found C-M130(xC2-PK2/M386, C1b1a1-M356) in 1.9% (1/53) of a sample of Pashtun from Kunduz, Afghanistan and in 1.4% (1/69) of a sample of Hazara from Bamiyan, Afghanistan. Wang et al. (2014) have found C-M130(xM105, M38, M217, M347, M356) in 5.6% (1/18) of a sample of Horpa Qiang from Danba County of Sichuan, China and in 2.2% (1/46) of a sample of Khams Tibetans from Xinlong County of Sichuan, China. The Y-STR haplotypes of these two individuals match the modal C* haplotype from the study by Zhong et al. (2010) at every comparable locus. Prior to 2002, there were in academic literature at least seven naming systems for the Y-Chromosome Phylogenetic tree. This led to considerable confusion. In 2002, the major research groups came together and formed the Y-Chromosome Consortium (YCC). They published a joint paper that created a single new tree that all agreed to use. The table below brings together all of these works at the point of the landmark 2002 YCC Tree. This allows a researcher reviewing older published literature to quickly move between nomenclatures. One particular haplotype within Haplogroup C-M217 has received a great deal of attention for the possibility that it may represent direct patrilineal descent from Genghis Khan. A research paper published in 2017 - "Genetic trail for the early migrations of Aisin Gioro, the imperial house of the Qing dynasty" confirmed that the Aisin Gioro clan belongs to haplogroup C3b1a3a2-F8951, a brother branch of C3*-Star Cluster (currently named as C3b1a3a1-F3796, once linked to Genghis Khan). ^ a b Wang, CC; Li, H (2013). "Inferring human history in East Asia from Y chromosomes". Investig Genet. 4 (1): 11. doi:10.1186/2041-2223-4-11. PMC 3687582. PMID 23731529. ^ a b c d e f Zhong H, Shi H, Qi XB, et al. (July 2010). 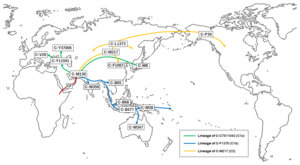 "Global distribution of Y-chromosome haplogroup C-M130 reveals the prehistoric migration routes of African exodus and early settlement in East Asia". J. Hum. Genet. 55 (7): 428–35. doi:10.1038/jhg.2010.40. PMID 20448651. ^ a b c Tumonggor, Meryanne K; Karafet, Tatiana M; Downey, Sean; et al. (2014). "Isolation, contact and social behavior shaped genetic diversity in West Timor". Journal of Human Genetics. 59 (9): 1–10. doi:10.1038/jhg.2014.62. PMC 4521296. PMID 25078354. ^ a b Scheinfeldt, L.; Friedlaender, F; Friedlaender, J; Latham, K; Koki, G; Karafet, T; Hammer, M; Lorenz, J (2006). "Unexpected NRY Chromosome Variation in Northern Island Melanesia". Molecular Biology and Evolution. 23 (8): 1628–41. doi:10.1093/molbev/msl028. PMID 16754639. ^ a b c d e f g h ISOGG, 2015 "Y-DNA Haplogroup C and its Subclades – 2015" (15 September 2015). ^ Karafet TM, Mendez FL, Meilerman MB, Underhill PA, Zegura SL, Hammer MF (2008). "New binary polymorphisms reshape and increase resolution of the human Y chromosomal haplogroup tree". Genome Research. 18 (5): 830–8. doi:10.1101/gr.7172008. PMC 2336805. PMID 18385274. ^ a b Nagle, N.; et al. (2015). "Antiquity and diversity of aboriginal Australian Y-chromosomes". American Journal of Physical Anthropology. 159 (3): 367–81. doi:10.1002/ajpa.22886. PMID 26515539. ^ Hudjashov G, Kivisild T, Underhill PA, et al. (May 2007). "Revealing the prehistoric settlement of Australia by Y chromosome and mtDNA analysis". Proc. Natl. Acad. Sci. U.S.A. 104 (21): 8726–30. doi:10.1073/pnas.0702928104. PMC 1885570. PMID 17496137. ^ Seguin-Orlando, A.; et al. (2014). "Genomic structure in Europeans dating back at least 36,200 years" (PDF). Science. 346 (6213): 1113–1118. doi:10.1126/science.aaa0114. PMID 25378462. Archived from the original (PDF) on 2016-08-29. ^ a b Xue Y, Zerjal T, Bao W, et al. (April 2006). "Male demography in East Asia: a north-south contrast in human population expansion times". Genetics. 172 (4): 2431–9. doi:10.1534/genetics.105.054270. PMC 1456369. PMID 16489223. ^ a b c Hammer MF, Karafet TM, Park H, et al. (2006). "Dual origins of the Japanese: common ground for hunter-gatherer and farmer Y chromosomes". J. Hum. Genet. 51 (1): 47–58. doi:10.1007/s10038-005-0322-0. PMID 16328082. ^ Tajima, Atsushi; Hayami, Masanori; Tokunaga, Katsushi; Juji, T; Matsuo, M; Marzuki, S; Omoto, K; Horai, S (2004). "Genetic origins of the Ainu inferred from combined DNA analyses of maternal and paternal lineages". Journal of Human Genetics. 49 (4): 187–193. doi:10.1007/s10038-004-0131-x. PMID 14997363. ^ a b Lell JT, Sukernik RI, Starikovskaya YB, et al. (January 2002). "The dual origin and Siberian affinities of Native American Y chromosomes". Am. J. Hum. Genet. 70 (1): 192–206. doi:10.1086/338457. PMC 384887. PMID 11731934. ^ Wells RS, Yuldasheva N, Ruzibakiev R, et al. (August 2001). "The Eurasian heartland: A continental perspective on Y-chromosome diversity". Proc. Natl. Acad. Sci. U.S.A. 98 (18): 10244–9. doi:10.1073/pnas.171305098. PMC 56946. PMID 11526236. ^ Cox MP, Redd AJ, Karafet TM, et al. (October 2007). "A Polynesian motif on the Y chromosome: population structure in remote Oceania". Hum. Biol. 79 (5): 525–35. doi:10.1353/hub.2008.0004. hdl:1808/13585. PMID 18478968. ^ a b c Gayden, Tenzin; Cadenas, Alicia M.; Regueiro, Maria; Singh, NB; Zhivotovsky, LA; Underhill, PA; Cavalli-Sforza, LL; Herrera, RJ (2007). "The Himalayas as a Directional Barrier to Gene Flow". American Journal of Human Genetics. 80 (5): 884–894. doi:10.1086/516757. PMC 1852741. PMID 17436243. ^ a b Fornarino, Simona; Pala, Maria; Battaglia, Vincenza; et al. (2009). "Mitochondrial and Y-chromosome diversity of the Tharus (Nepal): a reservoir of genetic variation". BMC Evolutionary Biology. 9: 154. doi:10.1186/1471-2148-9-154. PMC 2720951. PMID 19573232. ^ a b Cadenas, Alicia M; Zhivotovsky, Lev A; Cavalli-Sforza, Luca L; Underhill, PA; Herrera, RJ (2008). "Y-chromosome diversity characterizes the Gulf of Oman". European Journal of Human Genetics. 16 (3): 374–386. doi:10.1038/sj.ejhg.5201934. PMID 17928816. ^ a b Abu-Amero, Khaled K; Hellani, Ali; González, Ana M; Larruga, Jose M; Cabrera, Vicente M; Underhill, Peter A (2009). "Saudi Arabian Y-Chromosome diversity and its relationship with nearby regions". BMC Genetics. 10: 59. doi:10.1186/1471-2156-10-59. PMC 2759955. PMID 19772609. ^ Scozzari R, Massaia A, D'Atanasio E, Myres NM, Perego UA, et al. (2012). "Molecular Dissection of the Basal Clades in the Human Y Chromosome Phylogenetic Tree". PLoS ONE. 7 (11): e49170. doi:10.1371/journal.pone.0049170. PMC 3492319. PMID 23145109. ^ "Dienekes' Anthropology Blog: Brown-skinned, blue-eyed, Y-haplogroup C-bearing European hunter-gatherer from Spain (Olalde et al. 2014)". 2014-01-26. ^ Fu, Qiaomei; et al. (2016). "The genetic history of Ice Age Europe". Nature. 534 (7606): 200–5. doi:10.1038/nature17993. PMC 4943878. PMID 27135931. ^ Karafet, T. M.; Mendez, F. L.; Meilerman, M. B.; Underhill, P. A.; Zegura, S. L.; Hammer, M. F. (2008). "New binary polymorphisms reshape and increase resolution of the human Y chromosomal haplogroup tree". Genome Research. 18 (5): 830–8. doi:10.1101/gr.7172008. PMC 2336805. PMID 18385274. ^ Pakendorf B, Novgorodov IN, Osakovskij VL, Danilova AP, Protod'jakonov AP, Stoneking M (October 2006). "Investigating the effects of prehistoric migrations in Siberia: genetic variation and the origins of Yakuts". Hum. Genet. 120 (3): 334–53. doi:10.1007/s00439-006-0213-2. PMID 16845541. ^ Mona, Stefano; Grunz, Katharina E.; Brauer, Silke; et al. (2009). "Genetic Admixture History of Eastern Indonesia as Revealed by Y-Chromosome and Mitochondrial DNA Analysis". Mol. Biol. Evol. 26 (8): 1865–1877. doi:10.1093/molbev/msp097. PMID 19414523. ^ Karafet Tatiana M.; Hallmark Brian; Cox Murray P.; et al. (2010). "Major East–West Division Underlies Y Chromosome Stratification across Indonesia". Mol. Biol. Evol. 27 (8): 1833–1844. doi:10.1093/molbev/msq063. PMID 20207712. ^ Cite error: The named reference DiCristofaro2013 was invoked but never defined (see the help page). ^ Wei, Lan-Hai; Yan, Shi; Yu, Ge; Huang, Yun-Zhi; Yao, Da-Li; Li, Shi-Lin; Jin, Li; Li, Hui (2017). "Genetic trail for the early migrations of Aisin Gioro, the imperial house of the Qing dynasty". J Hum Genet. 62 (Mar 62(3)): 407–411. doi:10.1038/jhg.2016.142. PMID 27853133. Wikimedia Commons has media related to Haplogroup C of Y-DNA.